Photo by Sam Thiel Marshall’s Camryn Allex looks to pass during their game against Worthington on Friday. The Tigers defeated Worthington 67-45. 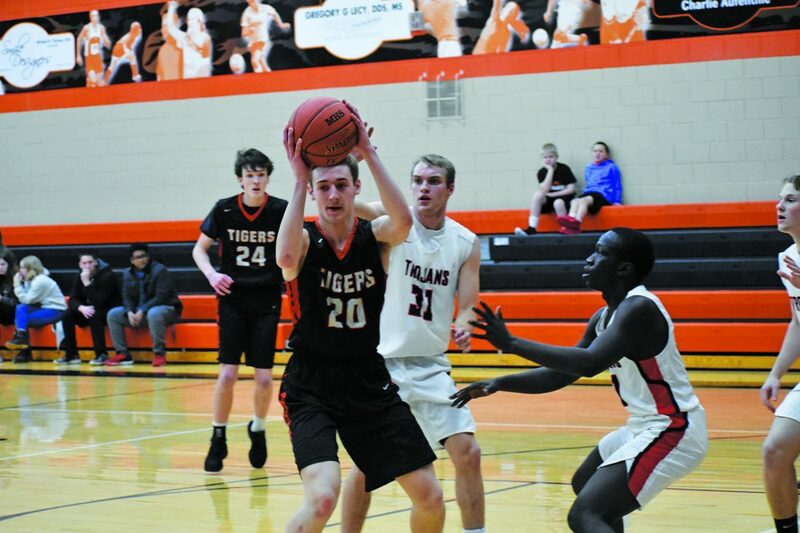 MARSHALL — Thanks in part to a stifling defensive performance in the first half, the Marshall boys basketball team defeated Worthington 67-45 on Friday. Marshall led 30-15 at halftime. Bryce Lance led Marshall with 17 points and seven rebounds. Matt Hmielewski added nine points while Josh Baker tallied eight points. Terbuto Ochothow scored 21 points to lead Worthington. 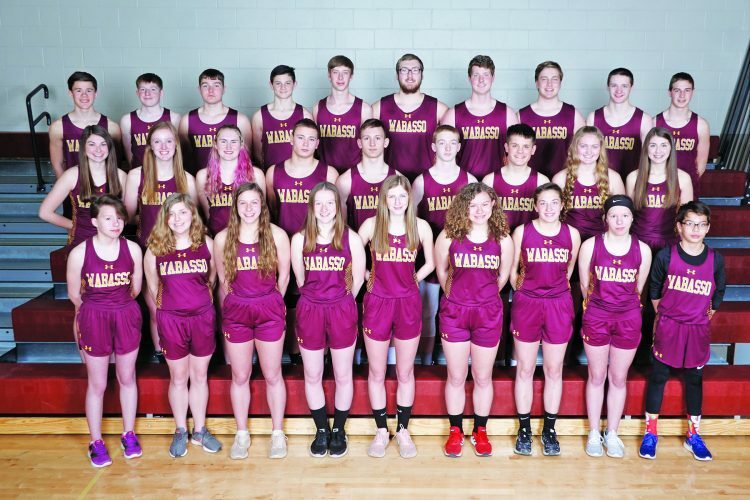 Marshall (14-5) travels to Windom Area today. This game was originally scheduled for Thursday, Feb. 7. MARSHALL: Aufenthie 1-2 0-2 2, Baker 3-6 0-0 8, Black 3-4 1-1 7, Bly 0-0 1-2 1, Ehlers 1-1 0-0 3, Hilgemann 1-2 0-0 2, Hmielewski 4-7 0-0 9, Jacobson 1-1 0-0 2, Lance 7-10 3-4 17, Paulsen 3-8 1-2 7, Pochardt 2-2 0-0 5, Steinbach 2-4 0-2 4. REBOUNDS: Worthington 15; Marshall 42 (Lance 7). ASSISTS: Worthington 3; Marshall 13 (Allex 4). STEALS: Worthington 10; Marshall 9 (Allex 2). BLOCKS: Worthington 0; Marshall 0. FOULS: Worthington 11; Marshall 17. TURNOVERS: Worthington 14; Marshall 18. TYLER — Russell-Tyler-Ruthton defeated Canby 78-47 in boys basketball action on Friday. Carter Hansen led RTR with 22 points. Cooper Hansen added 19 points, 10 rebounds, five assists and seven steals in the win, while Payton Hess finished with 14 points. Riley Kockelman and Matt Groen led Canby with seven points apiece. 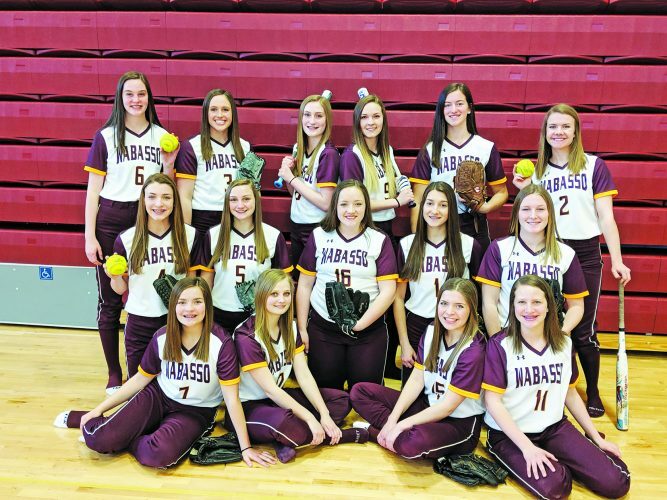 RTR (13-4) travels to Lac qui Parle Valley today while Canby (4-14) travels to Wabasso on Monday. CANBY: Kockelman 2-11 3-5 7, Sayre 3-9 0-3 6, Millner 1-1 0-1 2, Varcoe 1-7 4-6 6, Thovson 1-5 0-0 3, Harding 1-2 0-0 2, Groen 3-3 1-1 7, Stoks 2-5 0-0 5, Hansen 2-2 0-0 4, Bruns 0-2 1-2 1, Wente 2-4 0-6 4. RUSSELL-TYLER-RUTHTON: Hess 4 2-3 14, Williams 1 0-0 3, Kelley 3 1-4 9, Ca. Hansen 10 2-3 22, Co. Hansen 5 6-9 19, Hauswedell 2 2-2 6, Kerr 2 1-4 5. REBOUNDS: Canby 33 (Wente 10); RTR 33 (Co. Hansen 10, Kerr 8). ASSISTS: Canby 9 (Kockelman 3); RTR 11 (Co. Hansen 5). STEALS: Canby 6 (Varcoe 3); RTR 12 (Co. Hansen 7). BLOCKS: Canby 2; RTR 2. FOULS: Canby 22; RTR 28 (Baune). TURNOVERS: Canby 21; RTR 8. TRACY — Lakeview went on the road to defeat Tracy-Milroy-Balaton 73-58 in boys basketball on Friday. Tyler Imes led Lakeview with 20 points and six rebounds. Parker Hoffman added 14 points in the win, while Billy Errington added 12 points and seven rebounds. Jett Davis led TMB with 20 points and 13 rebounds, while Jake Tauer added 19 points. Lakeview (5-13) faces Red Rock Central today at Southwest Minnesota State University, while TMB (9-8) travels to Canby on Tuesday. LAKEVIEW: Imes 8-14 1-2 20, Hoffman 4-7 5-6 14, Errington 5-8 2-4 12, Bot 4-4 3-4 11, Loe 3-10 3-10 10, Louwagie 2-3 1-2 6, Arends 0-0 1-2 1. TRACY-MILROY-BALATON: Tauer 7-19 1-2 19, Larson 2-11 0-0 5, Landherr 5-9 0-2 11, Timmerman 0-1 3-4 3, Davis 9-19 2-4 20. REBOUNDS: Lakeview 36 (Errington 7, Loe 7); TMB 29 (Davis 13). ASSISTS: Lakeview 14 (Loe 4); TMB 9 (Tauer 4). STEALS: Lakeview Lakeview 4; TMB 5 (Landherr 2). BLOCKS: Lakeview 2; TMB 2 (Davis 2). FOULS: Lakeview 14; TMB 20 (Timmerman). TURNOVERS: Lakeview 9; TMB 11. WORTHINGTON — The Marshall Tigers girls basketball team used a strong first half to defeat Worthingto 69-47 on Friday. Marshall led 41-27 at halftime. Abigail Wendorff led the Tigers with 23 points and eight rebounds. Jordyn Hilgemann added 17 points and six rebounds in the win. Madisyn Huisman scored 17 points to lead Worthington. 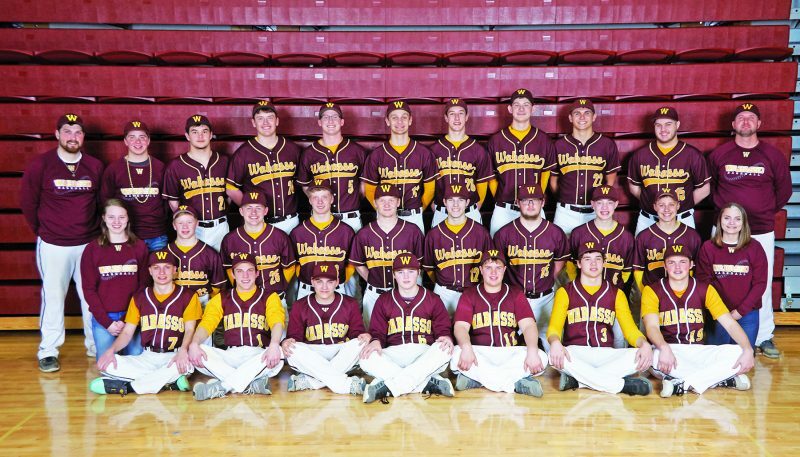 Marshall (14-5) travels to Windom Area this afternoon. This game was originally scheduled for Thursday, Feb. 7. MARSHALL: Sueker 1-5 0-0 3, Jones 3-3 0-0 8, Estrada 2-8 0-2 5, Hilgemann 5-11 5-8 17, Toulouse 0-0 2-2 2, Wendorff 6-9 8-9 23, Webb 0-0 2-2 2, Meier 2-6 1-2 5, Andries 2-6 0-1 4. REBOUNDS: Marshall 37 (Meier 12, Wendorff 8); Worthington 38. ASSISTS: Marshall 14 (Estrada 5); Worthington 11. STEALS: Marshall 9 (Estrada 3); Worthington 7. BLOCKS: Marshall 1 (Hilgemann 1); Worthington 7. FOULS: Marshall 14; Worthington 20 (Wietzema). TURNOVERS: Marshall 12; Worthington 12. TRACY — The Tracy-Milroy-Balaton girls basketball team defeated Canby 59-53 on Friday. Jadyn Lessman led the way for TMB with 16 points. Samantha Edwards added 13 points and 12 rebounds in the win, while Maddi Langerock scored 10 points. Hannah Jelen led Canby with 15 points and nine rebounds. TMB (6-14) travels to Yellow Medicine East on Monday while Canby (6-14) hosts Southwest Minnesota Christian today. CANBY: S. Hansen 5-16 1-1 14, Ruether 1-7 1-3 4, Cleveland 2-6 0-0 6, Jelen 3-19 9-14 15, Johnson 3-8 0-0 6, Wright 2-7 0-0 4, Bruns 2-8 0-0 4. TRACY-MILROY-BALATON: Smith 1-7 0-0 2, Wendland 2-6 0-0 5, Edwards 4-9 5-6 13, Lessman 4-12 7-8 16, Langerock 1-2 8-10 10, Dolan 2-4 3-5 7, Mayer 3-10 0-0 6. REBOUNDS: Canby 31 (Jelen 9, Johnson 8); TMB 47 (Edwards 12, Wendland 7, Mayer 7). ASSISTS: Canby 13 (Cleveland 3, Johnson 3); TMB 11 (Smith 4). STEALS: Canby 12 (S. Hansen 4, Jelen 3); TMB 9 (Smith 2, Peterson 2). BLOCKS: Canby 2 (Cleveland 1, Johnson 1); TMB 2 (Smith 1, Lessman 1). FOULS: Canby 21 (Ruether); TMB 17. TURNOVERS: Canby 15; TMB 24. OKABENA — Westbrook-Walnut Grove defeated Heron Lake-Okabena/Fulda 56-24 on Friday. It marked the first Chargers win since Dec. 18, 2018, ending a 12-game losing streak. Grace Woelber recorded a game-high 21 points for WWG, along with five assists and four steals. Camryn Bunting added 17 points and eight rebounds in the win. Chrissy Hermeling led HLO/F with six points. WWG (4-14) travels to Granada-Huntley-East Chain/Truman/Martin Luther on Tuesday. WESTBROOK-WALNUT GROVE: Berglund 2-3 0-0 4, VandeKieft 2-7 0-0 4, Byers 1-4 0-0 2, Bunting 7-11 3-6 17, Woelber 6-16 5-6 21, DeSmith 2-4 4-5 8. REBOUNDS: WWG 44 (DeSmith 10, VandeKieft 9). ASSISTS: WWG 12 (Woelber 5). STEALS: WWG 8 (Woelber 4). BLOCKS: WWG 4 (Bunting 2). FOULS: WWG 7. TURNOVERS: WWG 14. FAIRMONT — Friday night’s Big South Championship wrestling dual in Fairmont was a matchup between Fairmont/Martin County West and Marshall, the two highest-ranked teams in Section 3AA. The home team took the conference title as the No. 4-ranked RedBulls defeated the No. 10-ranked Tigers 44-18. F/MCW had the advantage fromthe start, winning the first nine bouts to take a 41-0 advantage through the 160 bout. At 170, Elijah Sterner topped Mario Maldonado to give Marshall its first three points of the night. Zach Stahl added a win by decision over Garrett Myren. Marshall recorded a pair of pins, as Tyler Timm took down Shayne Steinbrink and Jaiden Bahr pinned Everardo Hernandez. F/MCW took the heavyweight bout to close out the 44-18 victory. 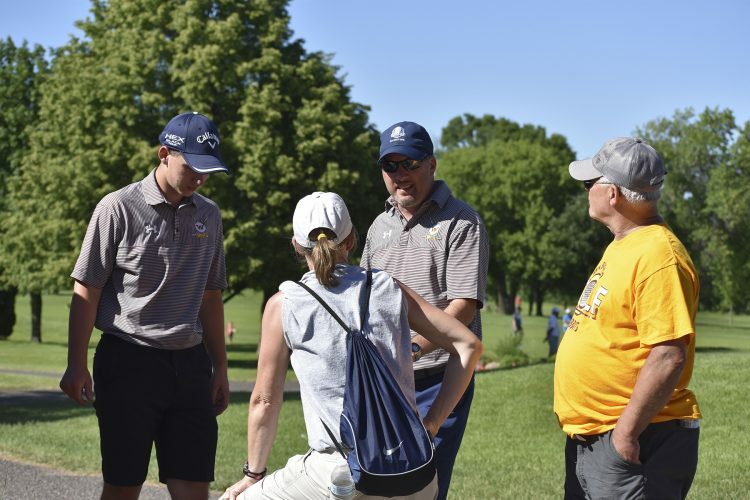 Marshall enters the Section 3AA Team Tournament as a No. 1 seed. The Tigers will host a trio of bouts on Thursday, as Marshall will face the winner of the United vs. New London-Spicer match in its first postseason dual. 106 pounds: Jesse Potts (FHS/MCW) major dec. Dylan Louwagie, 10-1. 113: Lucas Jagodzinske (FHS/MCW) pinned Hsa Khee Lar, 2:10. 120: Blake Jagodzinske (FHS/MCW) pinned Hsa Law Eh, 3:38. 126: Jaxson Rohman (FHS/MCW) pinned Connor Roth, 1:45. 132: Connor Simmonds (FHS/MCW) dec. Lucas Hodges, 4-2. 138: Cale Steuber (FHS/MCW) dec. Noah Jensen, 3-0. 145: Payton Anderson (FHS/MCW) pinned Coltyn Marcy, 1:23. 152: Miles Fitzgerald (FHS/MCW) major dec. Jackson Hughes, 14-3. 160: Nathan Simmonds (FHS/MCW) dec. Grant Louwagie, 5-3. 170: Elijah Sterner (MAR) dec. Mario Maldonado, 5-2. 182: Zach Stahl (MAR) dec. Garrett Myren, 6-0. 195: Tyler Timm (MAR) pinned Shayne Steinbrink, 3:40. 220: Jaiden Bahr (MAR) pinned Everardo Hernandez, 2:15. 285: Jacob Rahn (FHS/MCW) dec. Zach Felcyn, 5-1.